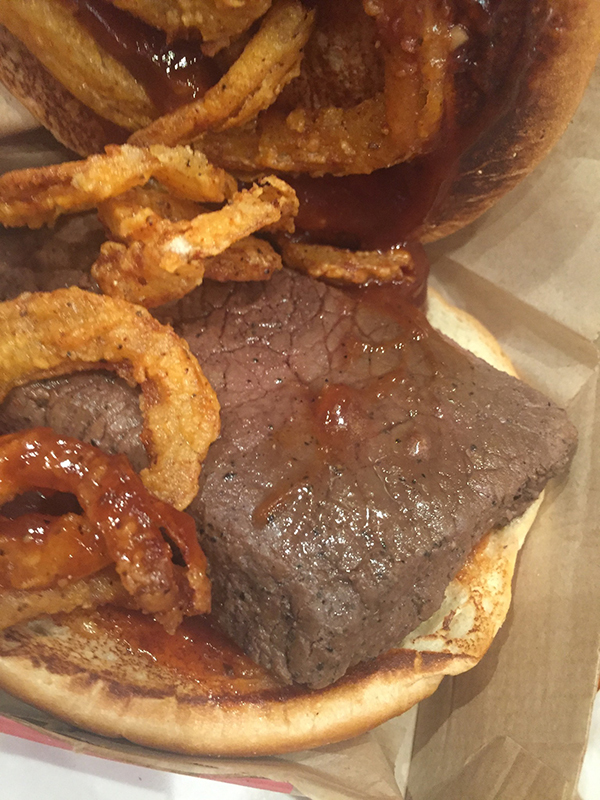 This is Arby’s venison sandwich. 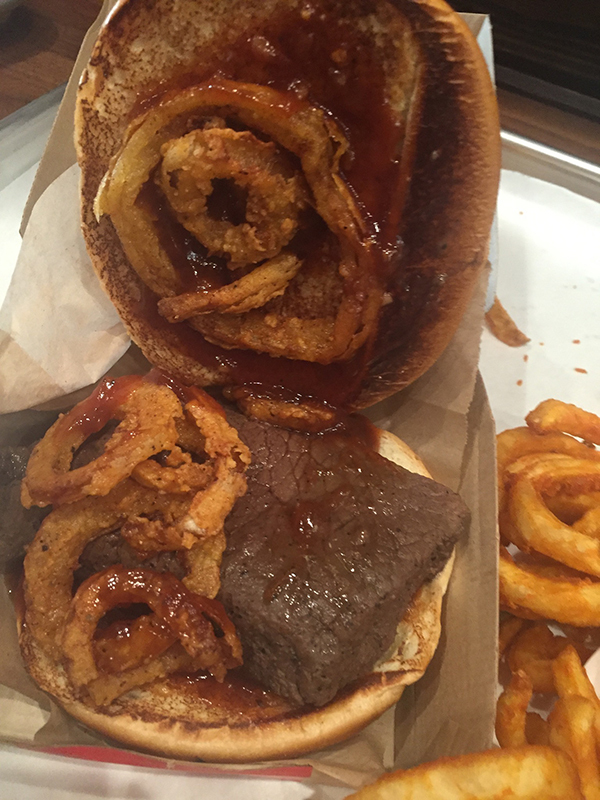 It’s made from 5 ounces of farm-raised New Zealand red tail deer (the top round and bottom round cuts), butterflied, marinated with garlic, salt and pepper, cooked in sous-vide and served on a toasted roll with fried onions and a Cabernet steak sauce infused with juniper. It costs $5, and you probably won’t be able to get your hands on it. The Atlanta-based chain introduced it as an extremely limited limited-time offer last November, at just 17 locations in big hunting communities like Clio, Mich., and Leechburg, Pa., for four days per store or while supplies lasted, which sometimes was as little as 15 minutes, Arby’s senior vice president of communications, Chris Fuller, told me while Arby’s executive chef Neville Craw saw to my sandwich. New York City is the next market to get the venison sandwich. A thousand of them will be available this Saturday at the chain’s new Madison Square Park location, which opened on Monday. They were good enough to invite me to come and try it early. The new Arby’s location is a big one — 3,500 square feet with a mezzanine with added seating and a large prep area in the basement, and when I got there at 1pm it had a substantial line of people. Fuller said it had been like that since 10 a.m., with the line sometimes extending out the door. Maybe there’s pent-up demand: This is just Arby’s second location on the island of Manhattan. There had been others previously but they all closed, and the chain’s only New York City location was in Queens until Arby’s opened a corporate store in Midtown. This second one is also a corporate store. At most of the locations where the venison sandwich was offered, just 500 of them were made available, and that wasn’t remotely enough to meet demand, Fuller said. The problem is that, although New Zealand’s venison industry is substantial and it provides the bulk of deer eaten in American restaurants, “They don’t make enough for America’s appetite,” Fuller said. Indeed, according to Deer Industry New Zealand, the whole country only raises about one million deer total each year. Considering that Arby’s sold 29 million sliders at its roughly 3,300 domestic locations in the first month that those things were available, a venison sandwich isn’t going to be a permanent addition, but Fuller said we can expect to see them popping up briefly from time to time. Which is a good thing, because it’s a tasty sandwich: chewy but not tough, with just a mild deer flavor and a sauce reminiscent of a Worcestershire-based steak sauce with a tang that reminded me a little bit of Arby’s Sauce. Craw wasn’t sure about that, and in re-tasting the Arby’s Sauce that I keep at my desk, he’s right; it’s a different tang. He said the Arby’s Sauce has a heavy dose of clove in it, whereas the venison sauce has juniper — a spice that he thought might be too snobby for Arby’s audience until he saw a recipe that used it in Field & Stream magazine and knew he was on the right track. Although your chances of sampling the venison sandwich are slim, you can always order the Meat Mountain. An off-the-menu item containing all the meat varieties that Arby’s has at its restaurant. It’s $10, and I suggest that, if you order it, you tip it over, spread it out and serve it like a deli tray for a party of six. Recently Arby’s upgraded the Meat Mountain by putting the fish in its fish sandwich on top. That became available on March 1, also for $10, and on March 2 they sold at least six of them at the new Arby’s location. Fuller said that they tend to be ordered in pairs, by two dudes challenging each other. I doubt it’s a moneymaker, but Fuller didn’t seem to care about that. “It’s the long-term value of the guest versus the per-sandwich value,” he said.